“Then I saw one lonely 78 rpm record in a later-period yellow paper sleeve, and picked it up — the Andrews Sisters’ BEI MIR BIS DU SCHOEN — which, as my good friend Rob Rothberg would tell you, is a Bobby Hackett sighting of the highest order, especially on the original Decca issue. I weighed that record in my hand, decided I didn’t need it, although it was a good omen, even at $3.99. Then I saw more. Record-hunting, for me, always mixes uncontrollable excitement and melancholy. Who died? Who’s in assisted living? Who will never hear J.C. Higginbotham again? A few of the records had sleeves noting that they had come from one Peter Dilg of Baldwin, purveyor of antique phonographs. Peter, where are you now? And a postscript — written after I’d published this blogpost: someone who’d owned at least one of these 78s was a hot-jazz collector after my own heart, because on the paper sleeve of one [a different record, of course] in neat handwriting, he’d noted that Chick Bullock was the singer, and the band was a very nice swinging group — listing each member by name and instrument and giving the recording date. Sir, where are YOU now? But such melancholy thoughts are always balanced by the child, silently hollering LOOK WHAT I GOT! But now, in my June-warm apartment, I can grade student essays to the finest accompaniment. And although it might be presumptuous to think this, I feel gratitude to the Goddess for letting me be in that space and find these sacred relics which — as we know — still sound good in 2017. Twenty-none dollars and some cents, if you’re curious. And when I die, I hope my friends are around to divide up the musical bounty. What they don’t want will — if I am lucky in the spirit-world — will end up at some thrift shop, giving the next generation a story with equal pleasure. The “buff Bluebird” label is very appealing to the eye and nostalgic for me, so I paused while scrolling through Tim’s latest cornucopia. Then I saw the band title, which was another inducement — because of its suggestion that hot jazz might be lurking behind that general monicker. 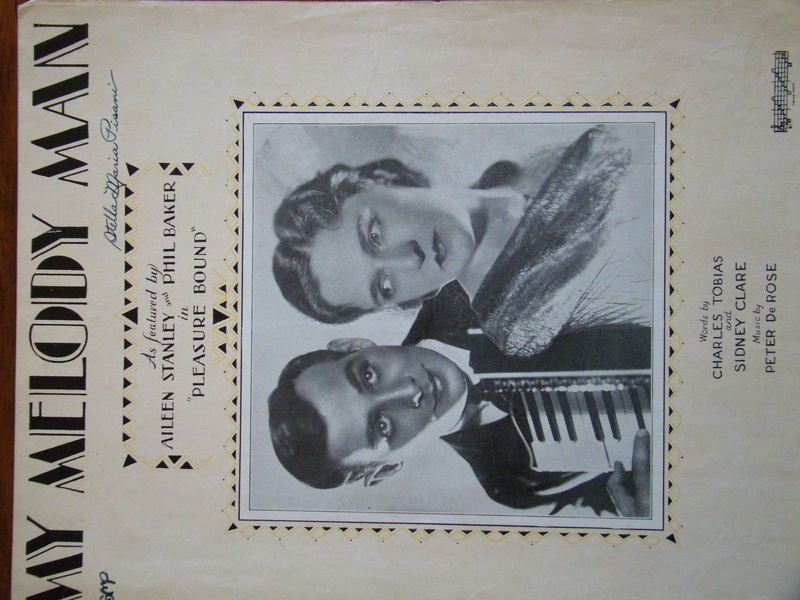 The band was “Tempo King And His Kings Of Tempo” : Marty Marsala, trumpet; Joe Marsala, clarinet; Queenie Ada Rubin, piano; Eddie Condon, guitar; George Yorke, string bass; Stan King, drums; Tempo King, vocal, leader: another one of the swing combos, their roots in Fifty-Second Street, to emulate and ride alongside the Fats Waller phenomenon. I couldn’t find out much about Frank Ryerson, except that he also was one of the composers of BLUE CHAMPAGNE, and what we used to call The World Wide Web (remember?) told me that he was a trumpeter in Glen Gray’s orchestra. Why the alias? Ordinarily bands recorded four sides in a three-hour session; this one was particularly fertile, and this band turned out seven usable sides. So Bluebird 6690 had this recording on one side; on the other, a performance by Frank Tanner (leader of a Texas-based orchestra), SAILOR MAN RHYTHM. It’s a good record, a lot of fun, and an otherwise hidden performance. Thanks, Tim. Here are the very exciting results of our trip to an antique store in Vallejo and a community thrift store in Benicia — both less famous towns in California. Thus the setup for the chorus is coming from an eager but less-sophisticated young man who wants to take Lessons in Love. Who would have guessed it? Not jazz by any means, but captivating. 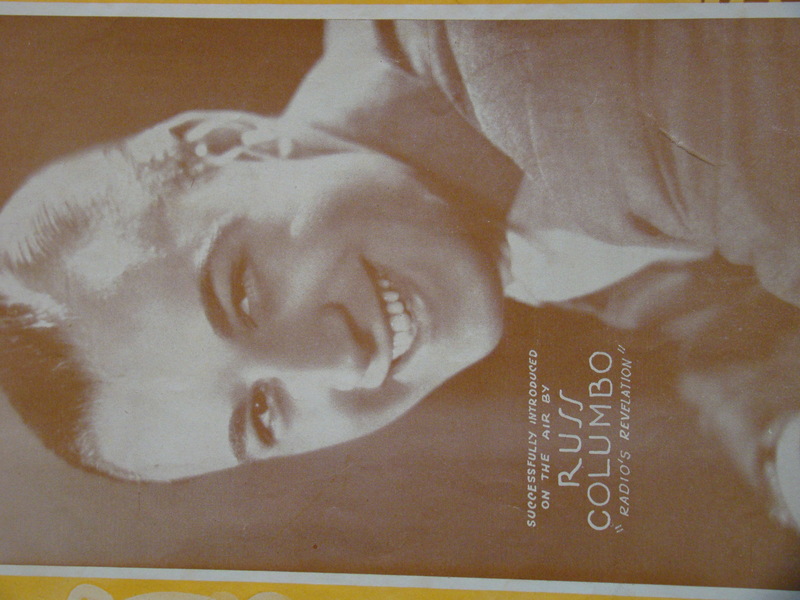 I hadn’t known that Russ Columbo was RADIO’S REVELATION. Having bought the sheet music for YOU CALL IT MADNESS, BUT I CALL IT LOVE, I’ve learned something both new and essential. 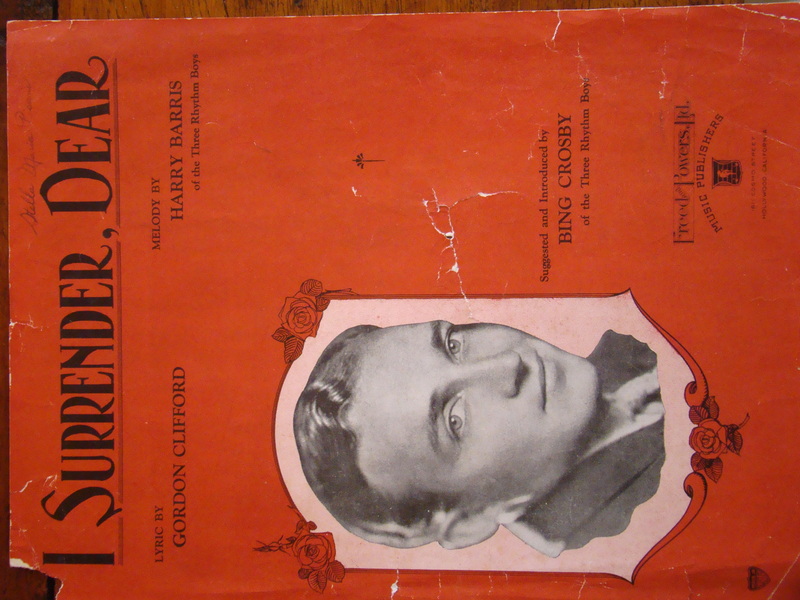 I had never heard or heard of this 1929 song (lyrics by Charles Tobias and Sidney Clare, music by Peter DeRose). By no means is it an unknown classic, but here are the lyrics to the bridge: “He plays most everything the masters wrote / He plays them heavenly and doesn’t read a note.” Hot enough for me. This one is a treasure for obvious reasons and more. I knew this lovely song from Bing’s 1931 recording, but had no idea that it has been associated with Miss Connie Boswell. And it has a personal meaning for me. My father was born in 1915, and the songs of his childhood became the songs of mine, even though I didn’t exactly know the titles or the complete versions. He is dead almost thirty years, and I can still hear him singing, “Leaves come tumbling down / ‘Round my head / Some of them are brown / Some are red,” although I don’t think he ever got as far as the bridge. I think he also sang it to his granddaughters, several of whom might remember the tune. Now, John Conte was not a pseudonym for Red McKenzie or Boyce Brown, and the other side looks just as far away from hot jazz as the first. 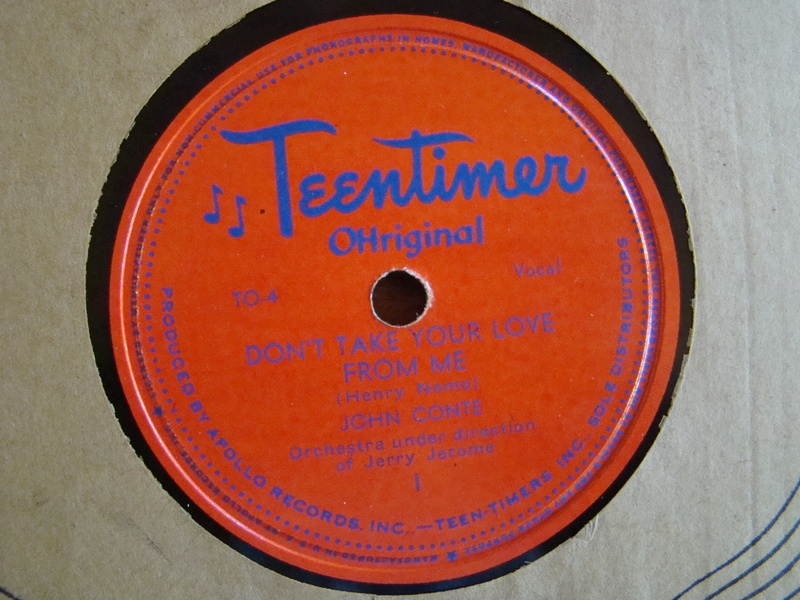 But the TEEN TIMER label stopped me from going on to the next record. 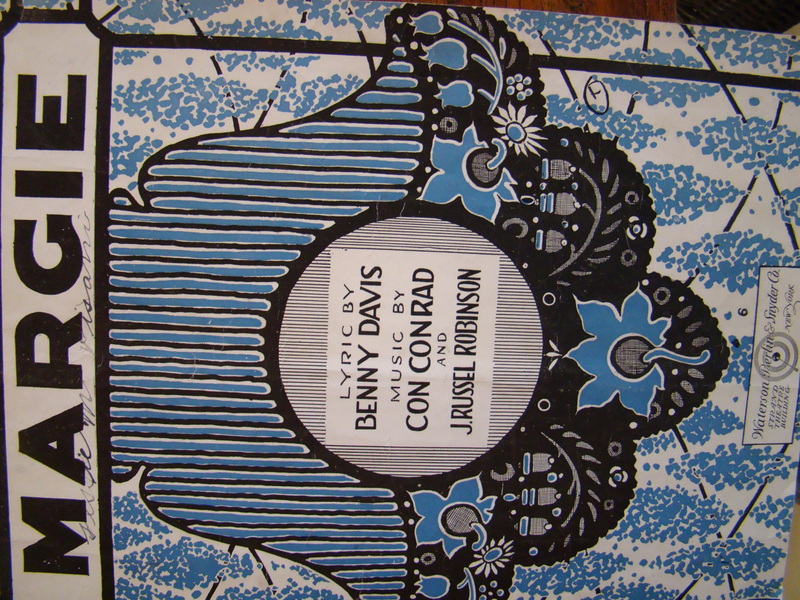 Perhaps twenty-five years ago, the musician and scholar Loren Schoenberg (who now heads the Jazz Museum in Harlem) had a weekly radio program on Columbia University’s WKCR-FM, and one of his august guests was the tenor saxophonist Jerry Jerome. 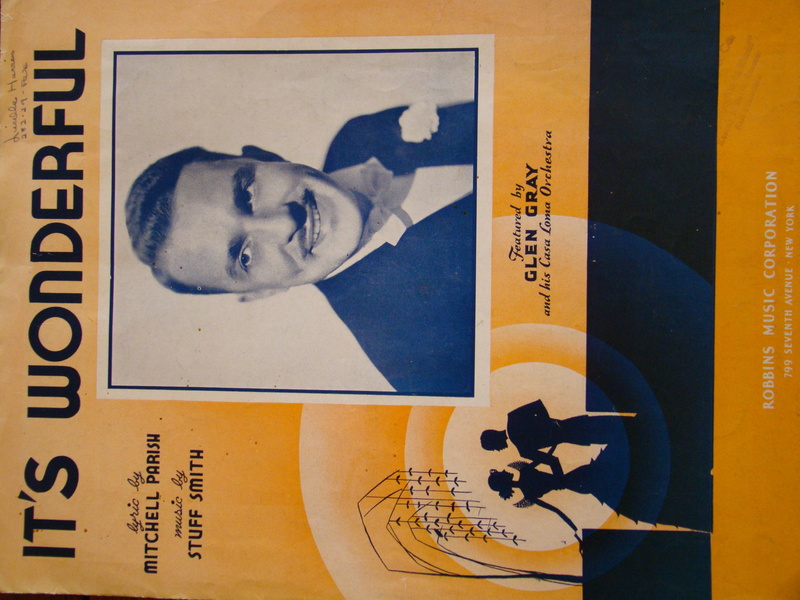 Jerry brought along a number of rarities, and one of them sprang from a radio program (circa 1944) for which he led the house band. The TEEN TIMERS orchestra was an astonishing collection of the best New York City studio players / hot soloists. I remember Chris Griffin and Will Bradley, Hymie Schertzer, Johnny Guarneri, Eddie Safranski, and Dave Tough were in the band — identifiable not only by their sound, but because that day the program might have run short, so the players were allowed to stretch out on a ONE O’CLOCK JUMP where they were identified by name. (I learned online that it was a Saturday morning show on NBC; the singing star was Eileen Barton — later to have a big hit with IF I KNEW YOU WERE COMING, I’D A BAKED A CAKE) and the announcer was Art Ford — late 1944, early 1945. So TEEN TIMERS — perhaps a hopeful effort by Apollo Records (for whom Jerry did some producing of sessions) to attract the bobby-soxers — has the possibility of a hot obbligato or a lovely ballad interlude on this disc. Or perhaps a Dave Tough cymbal accent. We live in hope. 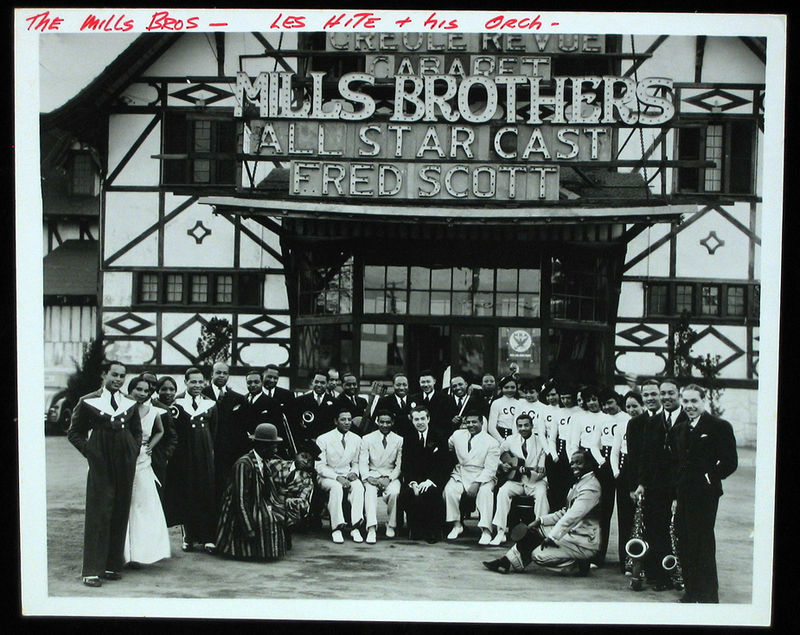 Are there any JAZZ LIVES readers who recall this radio program? Finally, you might be able to intuit how pleased I am with my finds. They didn’t cost much; they don’t weigh a great deal; they are filled with sentiment. But perhaps I should let Stuff Smith indicate the state of my emotions? P.S. A note on what some folks call “provenance”: most of the music above (and some I didn’t photograph — a Frank Crumit comedy song called I MARRIED THE BOOTLEGGER’S DAUGHTER) came from the collection of one musical young woman. I could trace some parts of her life: in one phase, she was Stella Carberry (in block capitals); in another, she signed in lovely cursive Stella Maria Pisani. 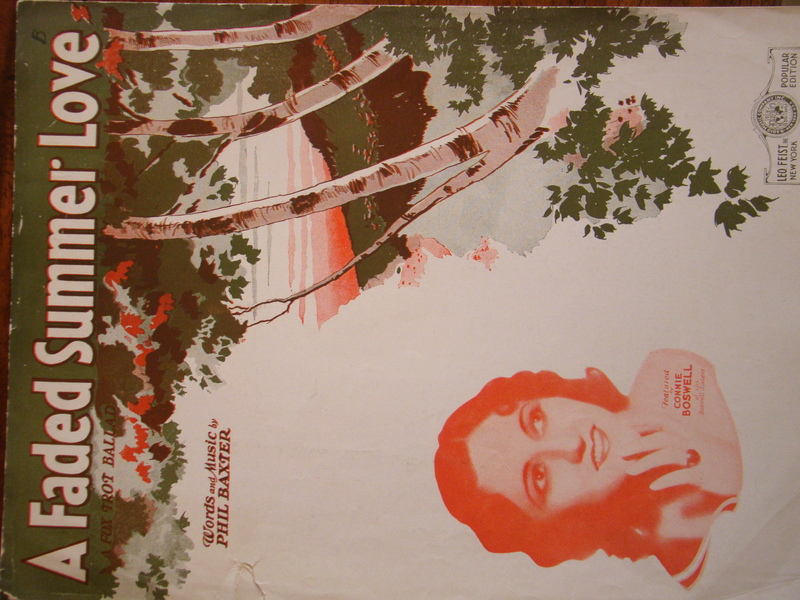 The copy of MARGIE belonged to Stella’s sister or even sister-in law (I am assuming) Tessie M. Pisani. Objects have their own lives and they reflect the people who once owned and loved them. 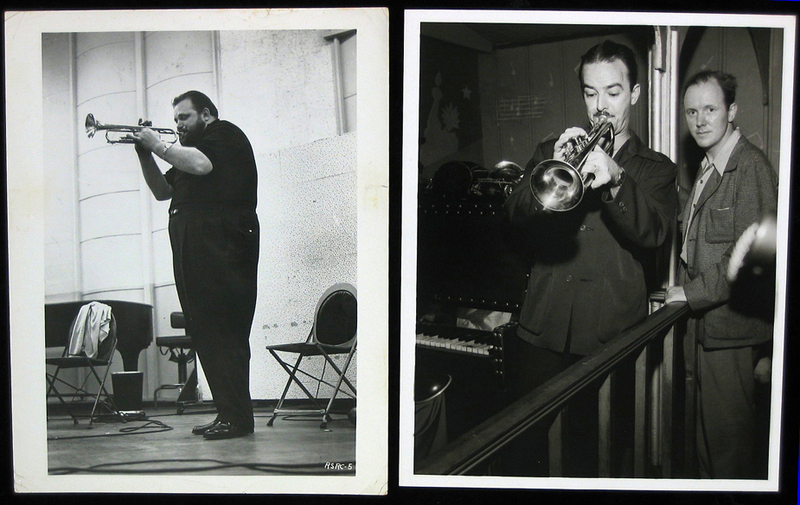 On the left, Al Hirt (possibly during his fame in the Sixties). 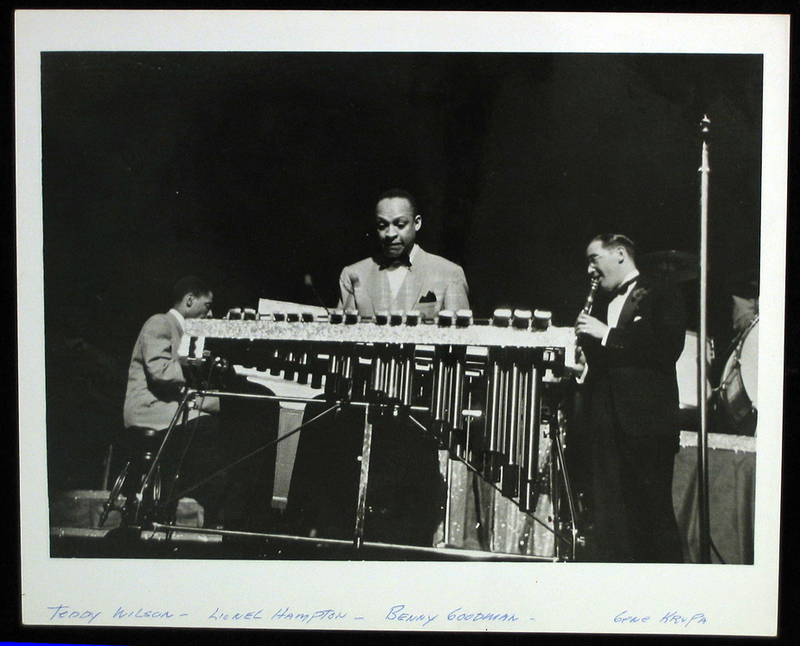 More interesting is a very thin Bobby Hackett on the right, working hard, with someone I can’t identify standing behind him, looking quizzically at the invisible photographer. At top, the King of Swing, possibly at the Madhattan Room — on the air for CBS. 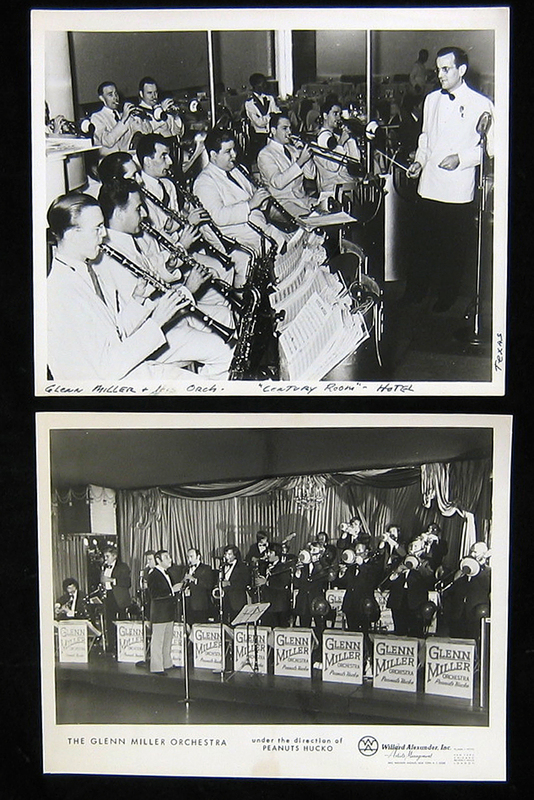 Below, circa 1948: is that Wardell Gray to the extreme left in the saxophone section? 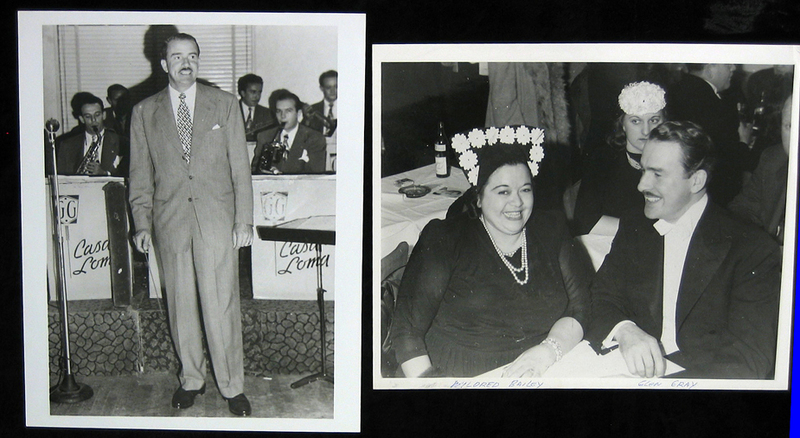 Early Thirties, on the West Coast — CREOLE REVUE . 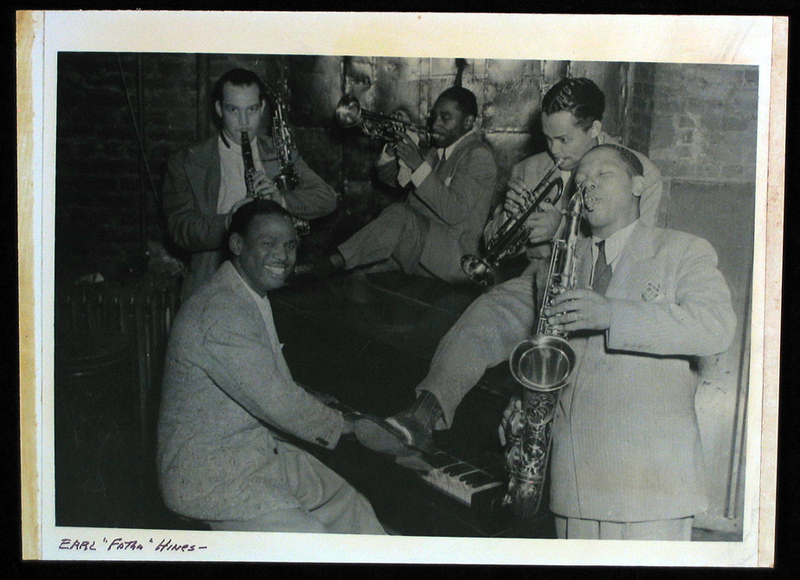 . .
Ellington in the Forties (the first band shot has Ben Webster, Sonny Greer, probably Junior Raglin — 1943? ); the second is twenty years or so later, with Lawrence Brown, stalwart, on the far left. Probably Chicago? 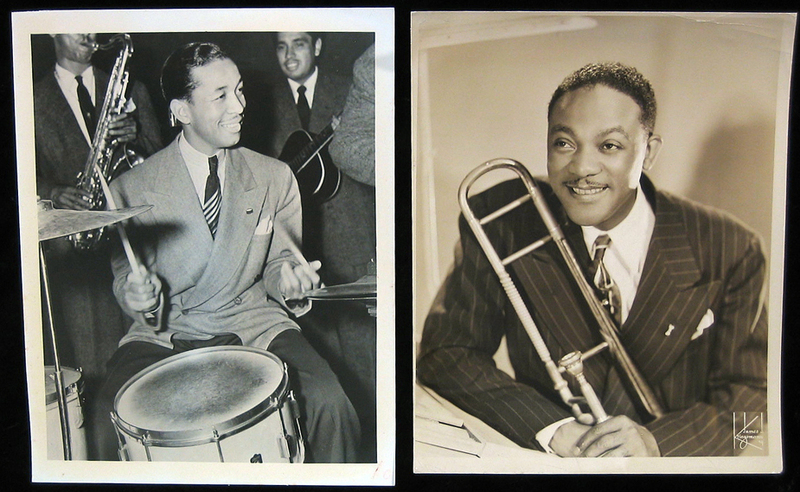 Earl Hines, Billy Eckstine on trumpet, Budd Johnson on tenor saxophone. Are the two other musicians Scoops Carey and Shorty McConnell? 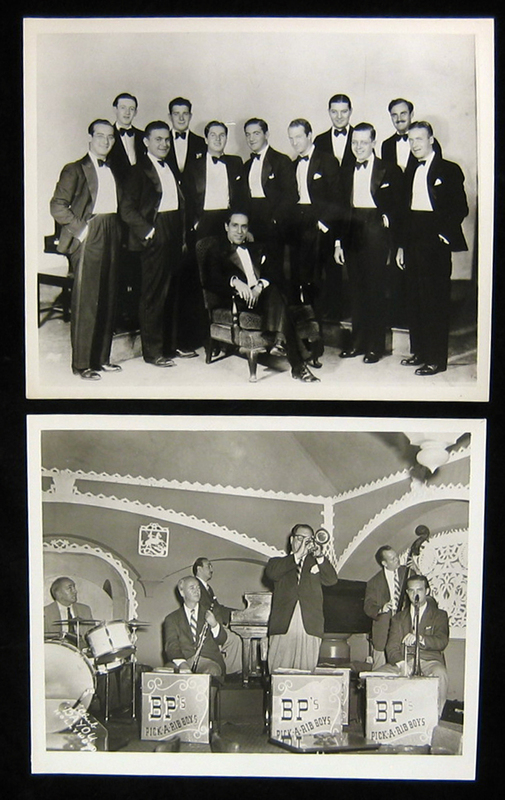 I have to say very quietly that I am less interested in Glenn Miller and his many orchestras than many people: what interests me here is not the ghost band below, but the top portrait that has a portly Irving Fazola sitting in the reed section on a gig in Texas, early in Miller’s bandleading career. Who’s the pretty lady with the astounding hat sitting with Glen Gray on the right? Looks like Miss Mildred to me, grinning happily. Whatever Glen said to her must have been delightful! Two unrelated Johnsons, J.J. and Gus (they both swung)! Circa 1937 or 38 — Teddy, Hamp (concentrating hard), and Benny (paying attention): Gene got cut off, but we know he was having fun, too. 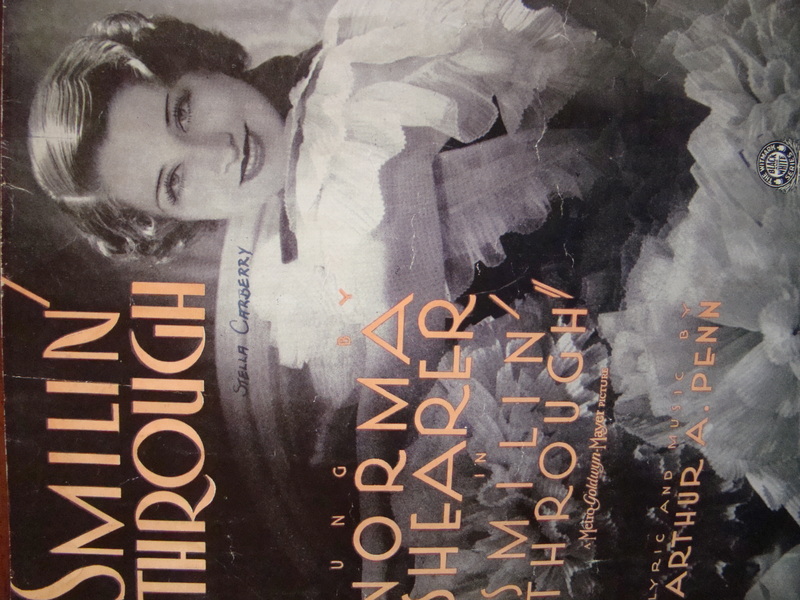 The top portrait is just amazing to those of us who are deeply immersed in this art — an autographed picture of Kaiser Marshall in 1938, in Europe (wow! 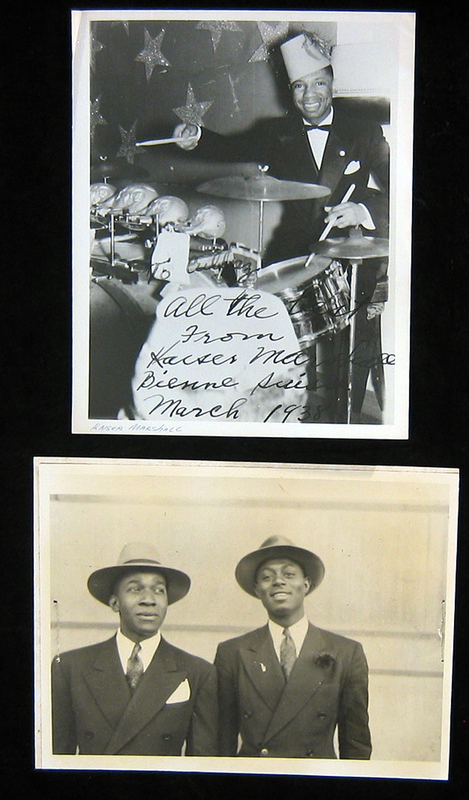 ); the second is listed as guitarist Jimmy McLin and saxophonist Earl Bostic, when and where I can’t tell. The beautiful double-breasted suits say “late Thirties,” but that’s only a sartorial guess. 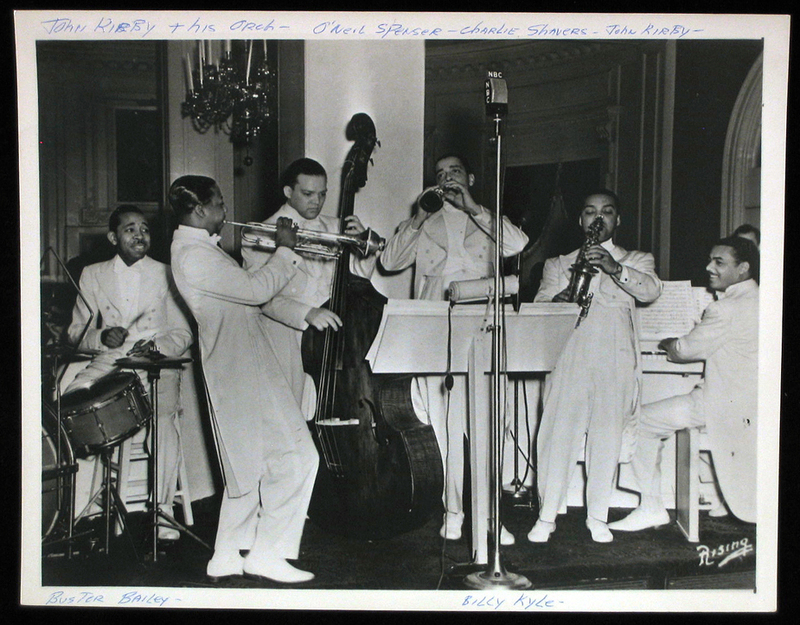 This portrait of the John Kirby Sextet lets us see the diminutive O’Neill Spencer in action — something more unusual than seeing Charlie Shavers, Russell Procope, Buster Bailey, and a pianist who’s not Billy Kyle. 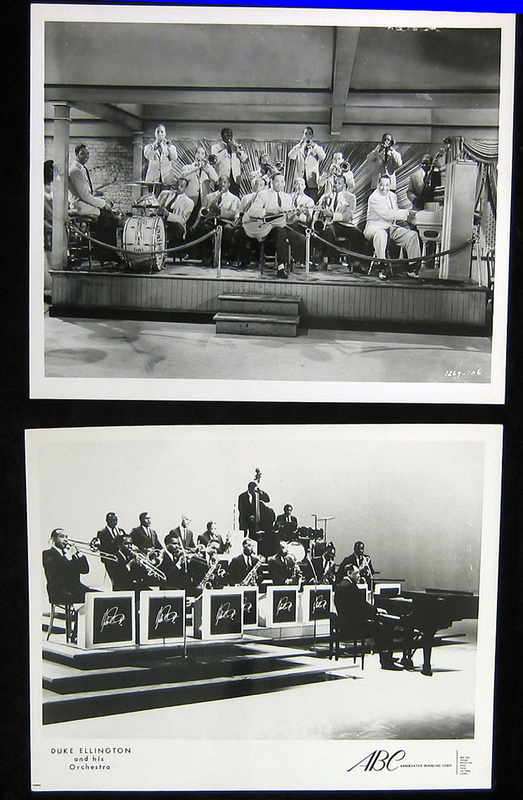 Clockwise: Benny Carter in a familiar publicity pose; a small band featuring Fats Waller’s reliably swinging drummer Slick Jones, and a famous shot from the Columbia studios, 1940, of John Hammond’s noble experiment melding the Basie and Goodman stars in what might have been the world’s finest small jazz band. 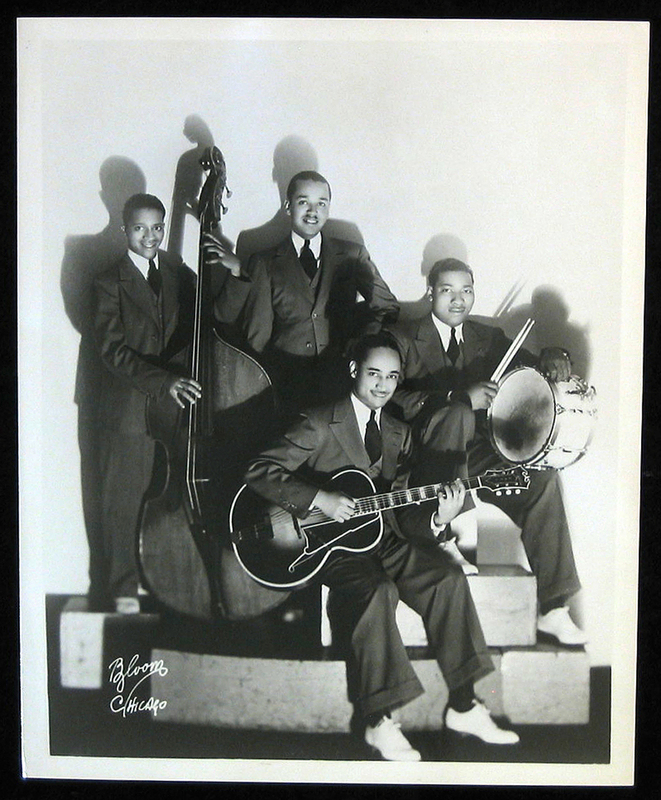 A famous Chicago studio portrait from 1936 but still gratifying: the rhythm section of Fletcher Henderson’s Grand Terrace Orchestra: Israel Crosby, bass; Bob Lessey, guitar; Horace Henderson, piano; Sidney Catlett, drums. Late Twenties, early Fifties, perhaps for Ben Pollack? 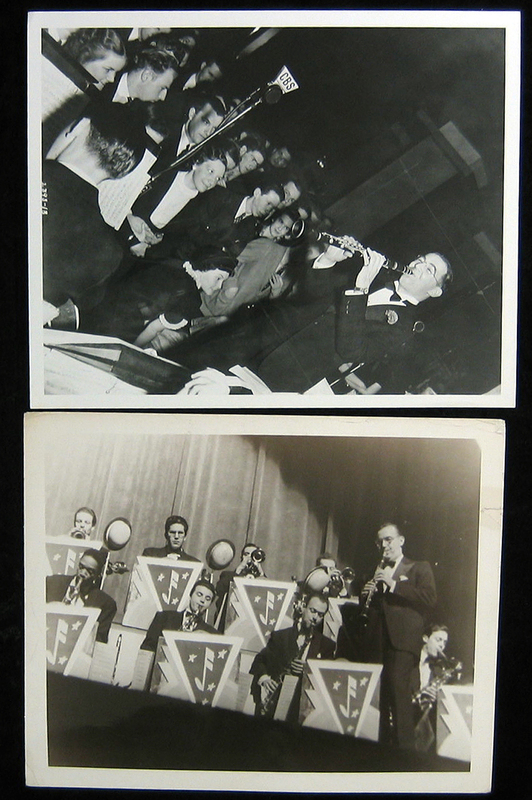 Jack Teagarden and Benny in the first photo, perhaps Charlie Teagarden (and the Pick-A-Rib Boys) in the second. Lee Young and J. C Higginbotham, both middle Forties if the suits are evidence. There’s that Louis fellow again! 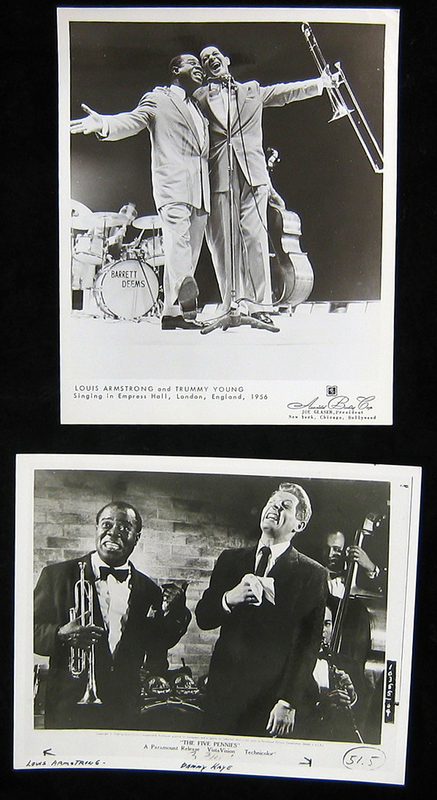 Ecstatically with Trummy Young (and an invisible Barrett Deems) at top, with Danny Kaye in THE FIVE PENNIES (1959) below. GOING PLACES indeed! 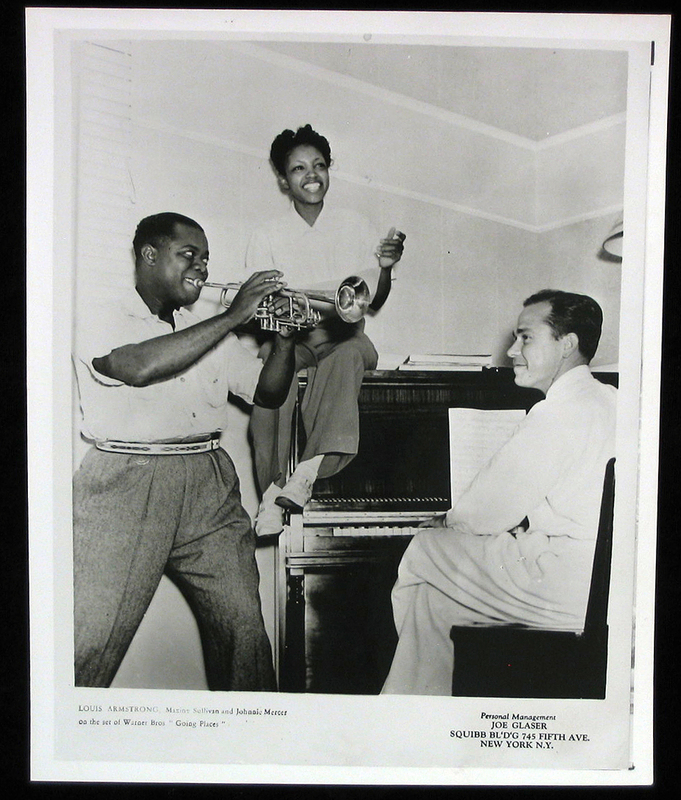 Louis, Maxine Sullivan, Johnny Mercer . . . no doubt rehearsing JEEPERS CREEPERS. 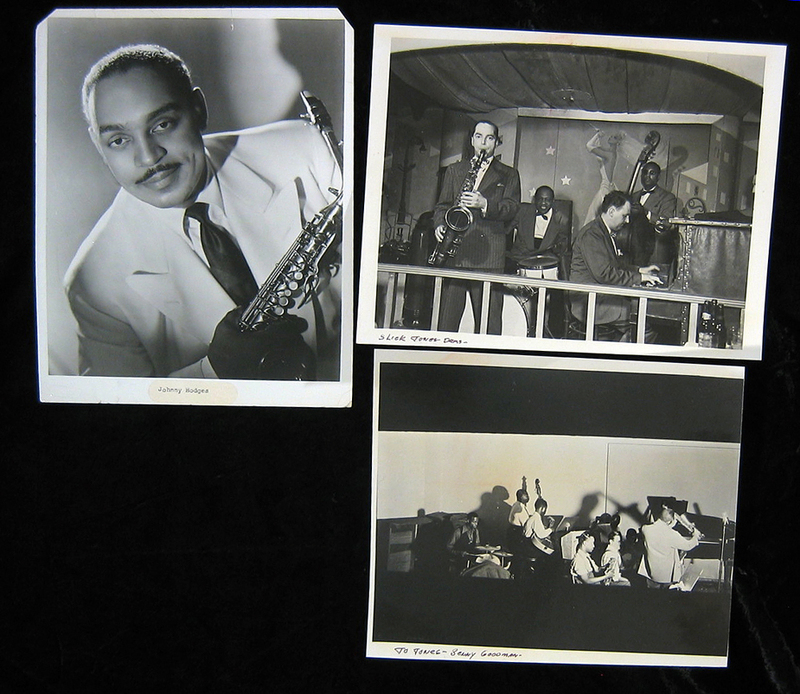 And a delightful piece of memorabilia from Phil Schaap’s new website — which not only features artifacts autographed by Wynton Marsalis and jazz broadcasts from WKCR, but also tangible morsels of jazz history. Can you hear Lips Page and Johnny Windhurst swapping lead and improvised countermelody? I certainly can imagine it! Visit http://www.philschaapjazz.com for more.